A Biography Of Howard R. "Buddy" Baker, Jr.
December 8, 1929: Howard R. and Evelyn Baker have a son  Howard R. Baker, Jr. at Hackensack Hospital. The child is brought to their home on Division Avenue in Hasbrouck Heights. 1935: The Baker family moves to 227 Hamilton Avenue  just across the street from the Police and Fire Departments. September, 1935: Buddy begins Kindergarten at Euclid School (K-8). June, 1944: Buddy graduates from Euclid School. In September of this year he will begin attending Hasbrouck Heights High School (Franklin School). 1944  1948: While attending High School, Buddy is active in sports playing 4 years of basketball, 3 years of baseball, 2 years of football, and one year of track. Buddy is also active in the Senior Chorus, Senior Male Chorus, the Christmas Pageant, the Yearbook Staff, and Hi-Y. September, 1947: While still in school, Buddy enlists in the New Jersey National Guard  50th Armored Division. June, 1948: Buddy graduates from Hasbrouck Heights High School. July, 1948: Buddy begins work with the State of New Jersey National Guard Vehicle Maintenance Division. 1950: Buddy begins working for his fathers company  Howard R. Baker Painting and Decorating. December, 1950: Buddy joins the Hasbrouck Heights Volunteer Fire Department. January 3, 1951: Buddy is appointed a Probationary Patrolman by the Hasbrouck Heights Police Department. July, 1951: Buddy meets waitress Bernice O'Brien at Diekman's Confectionary Store on the Boulevard. July 5, 1951: Buddy is appointed a regular Patrolman. March 18, 1952  April 29, 1952: Attends a police training school sponsored by the Bergen County Police Chiefs Association. February 23, 1953  April 2, 1953: Attends a police training school sponsored by the New Jersey State Police. December 6, 1953: Buddy and Bernice are married at the Lutheran Church of the Redeemer in Maywood. A reception follows at Koenigs in Hillsdale. January 13, 1957: Buddy and Bernice have their first child  Beverly Karen. June, 1957: Buddy and Bernice purchase their present home at 262 Hamilton Avenue. 1958: Buddy establishes Hasbrouck Heights first police darkroom and purchases towns first police photography equipment. March 2, 1958: Buddy and Bernice have their second child  Linda Diane. 1958: Buddy is elected to a two year term as President of the Bergen Police Pistol League. 1959: Hasbrouck Heights Pistol Team, lead by Captain Buddy Baker, wins the County Championship. October 26, 1959: Buddy and Bernice have twins  their third and fourth children  Sharon Elaine and Nancy Ellen. 1959: Buddy is elected President of PBA Local 102. His Local covered 20 towns with a membership of over 250 members. 1960: Buddy is elected State Delegate of PBA Local 102. 1961: Buddy becomes active with the Hasbrouck Heights Ambulance Squad. 1962: Patrolman Baker is assigned to Hasbrouck Heights first Radar Gun Patrol Unit. June 13, 1962: Buddy and Bernice have their fifth child  Carolyn Ann. 1962: Buddy is assigned to the Detective Bureau, including juvenile cases. 1963: Buddy is presented his Silver Life Membership Card in the New Jersey State PBA for being elected State Delegate from February 9, 1960 to September, 1963. June 1, 1964: Buddy is elected Lieutenant of Hasbrouck Heights Fire Department Engine Co. #2. September 4, 1964: Buddy and Bernice have their sixth child and first son  Howard R. Baker, III. February 15, 1965: Buddy is promoted Sergeant of the Hasbrouck Heights Police Department and is assigned to Patrol Division. June 1, 1965: Buddy is elected Captain of Hasbrouck Heights Fire Department Engine Co. #2. June 6, 1965: Buddy and Bernice have their seventh child  Alan Frank. July, 1965: In addition to his patrol duties, Buddy is appointed the towns first Traffic Officer  responsible for the investigation of traffic complaints and traffic surveys. 1966: Sergeant Baker is certified as a Breathalyzer Operator. 1966: Sergeant Baker, under the direction of Chief "Hap" Carty, purchases a 3M Traffic Sign Applicator to save the Borough money. Over a four year period, he will make over 900 signs. September 8, 1966: Buddy becomes an Exempt Member of the New Jersey State Firemans Association. January 5, 1967: Buddy and Bernice have their eighth (and last!!) child  Diane Gail. June 1, 1967: Buddy is appointed Mechanic of Hasbrouck Heights Fire Department Engine Co. #2. January 1, 1970: Buddy is promoted to Lieutenant of the Hasbrouck Heights Police Department. January, 1970: Lieutenant Baker places in operation the Boroughs first Record Room. June 22, 1971: Buddy is promoted to Captain of the Hasbrouck Heights Police Department. 1971: Buddy coordinates the Topics Traffic Light Study to cover the installation of new traffic lights within the Borough through State and Federal grants. 1972: Buddy is presented his Silver Life Membership Card in Bergen County PBA Local 102 for 20 years of service. June 1, 1973: Buddy is elected 2nd Assistant Chief of the Hasbrouck Heights Fire Department along with Chief Jack Ball and 1st Assistant Chief Bob Guarnella. September 1, 1973: Buddy is promoted to Deputy Chief of the Hasbrouck Heights Police Department. January 1, 1975: Buddy is appointed Acting Chief of the Hasbrouck Heights Police Department. 1975: Buddy establishes the Hasbrouck Heights Traffic Bureau and assigns Lieutenant Gerry Dommenge as Traffic Officer. 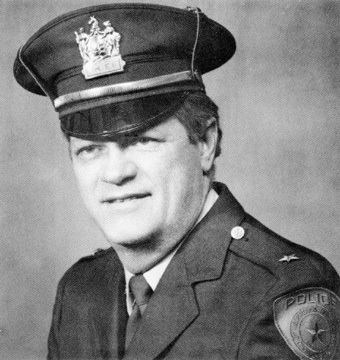 1975: Buddy reorganizes the Juvenile Bureau structure and institutes the Youth Guidance Council and Juvenile Conference Committee with the assistance of Captain Robert Ramsey. September 23, 1975: Buddy is appointed Chief of the Hasbrouck Heights Police Department. March 8, 1976: Buddy establishes the first 911 system in Bergen County with assistance from Commissioner Ken Mathis, Police Commissioner Rico Pagliei and Borough Clerk Robert Rafford. 1978: Renovates the Police Desk area and purchases new radio equipment for the desk and in the patrol cars with the assistance of Captain Joe Aversa. 1981: Oversees the purchase of the SPEN Radio System and the MARS Computer System. February 7, 1982: Buddy and Bernice become first time grandparents with the birth of grandson David Shaun. 1984: Buddy is appointed Deputy Emergency Management Coordinator of Hasbrouck Heights. November 17, 1984: Hasbrouck Heights Fire Department Engine Co. #2 honors Buddy for 25 years of service. 1985: Honored by PBA Local #102 with his Gold Life Membership Card. 1985: Receives the Hasbrouck Heights Mens Association. Outstanding Service Award for his efforts toward the betterment of civil affairs. 1985: Receives a citation from the New Jersey Senate for being selected Outstanding Citizen of Hasbrouck Heights for his many years of dedicated service. May 19, 1986: Buddy and Bernice become second time grandparents with the birth of grandson Steven Eric. August 29, 1986: Buddy and Bernice become third time grandparents with the birth of granddaughter Kimberly Erin. September 14, 1987: Buddy and Bernice become fourth time grandparents with the birth of granddaughter Amanda Lindsay. 1988: Organizes and drafts the extensive Borough of Hasbrouck Heights Emergency Operations Plan with Captain Bruce Werner and Emergency Management Coordinator Dr. Roger Szanto. May 25, 1988: Buddy and Bernice become fifth time grandparents with the birth of granddaughter Taryn Nicole. 1989: Establishes the Hasbrouck Heights DARE Program in the Borough schools and assigns Lieutenant Edwark Chermark to teach the program and Captain Bruce Werner to coordinate all snap agreements and activities. The program has grown over the years and three additional officers are now also qualified to teach DARE. May 31, 1989: Buddy receives the Chiefs Achievement Award from the Bergen County Police Chiefs Association in recognition of the service performed in keeping with the highest traditions of the police profession and for his work with the Juvenile Officers Association. 1990: Establishes and negotiates the first Hasbrouck Heights Police Department rules and regulations, with the assistance of Captain Bruce Werner. These rules were authorized, approved, and placed into effect by Police Commissioner Andrew Link on November 26, 1991. 1990: Institutes the LIERS Reporting System and Departmental Computer System. Purchases and has installed a new CCTV for the police entrance and cell block. 1990: Oversees the purchase of new radar units. July 3, 1990: Buddy and Bernice become sixth time grandparents with the birth of granddaughter Taylor Louise. 1990: Buddy is appointed the E911 Coordinator to implement the new emergency 911 system with the Borough. 1991: Institutes the application and implementation of MDT (Mobile Data Terminals) in Headquarters and patrol cars to provide instant access to DMV, NCIC, and MARS records. February 13, 1992: Buddy and Bernice become seventh time grandparents with the birth of grandson Ryan Howard. October 7, 1992: Buddy and Bernice become eighth time grandparents with the birth of grandson Kevin Thomas. January 11, 1993: Buddy is honored by the Bergen County Juvenile Officers Association in appreciation of his services as liaison and representative for the Bergen County Police Chiefs Association from 1987 to 1992. October 1, 1993: Buddy will officially retire from the Hasbrouck Heights Police Department after 42 years and 9 months of service. Note: During the Chiefs years of service, there were several violent and serious criminal cases. Out of respect to the families of those victims, Chief Baker has requested that the Police Department investigations and prosecutions of these cases be omitted from his biography.